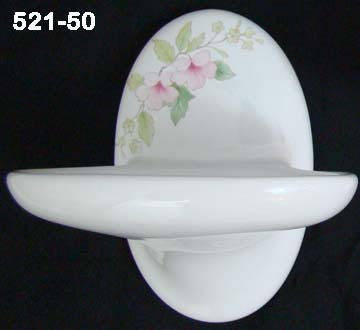 soap dishes, and toilet tissue holders available in White ceramic, and Blossoms on White floral pattern. The Classic Collection was discontinued by Lenape, BUT they just chose to bring it back in 2014 in the gloss white color and the Blossoms on White floral pattern. 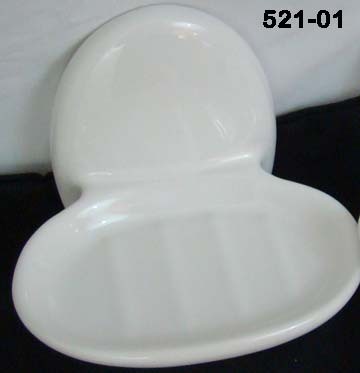 So the double towel bar and soap dish which had been sold out from 2010 to 2013 are now back! 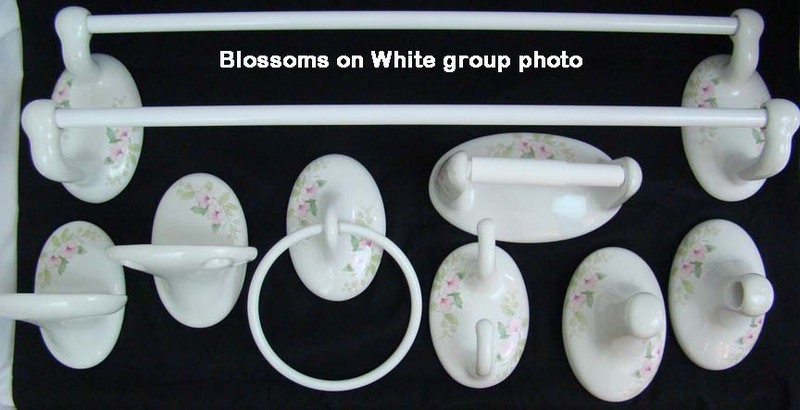 All items that we will show below in White and Blossoms on White are kept in our stock. 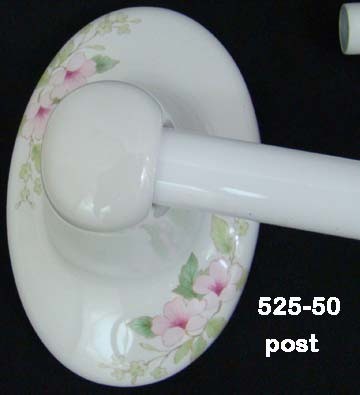 And we added the 528-01 and 528-50 double towel bars, same posts but with two 18" bars instead of the 24". As for the old bone color, that is still discontinued. We have just a few stray items left in our stock and they are noted in the price grid lower on the page. The Lenape porcelain items are made in their factory in Thailand. They are high quality ceramic, glazed and fired to perfection. 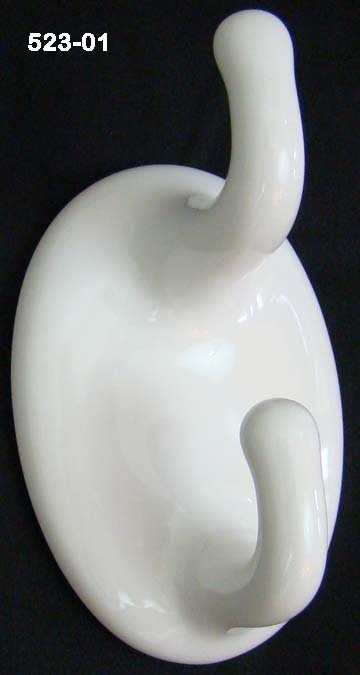 All Classic Collection items are clip mounted. Towel bars will come with two mounting clips each, all other pieces come with one mounting clip. 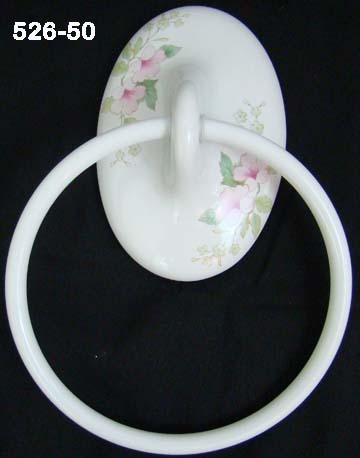 The toilet paper holder is wide, but still uses one mounting clip. 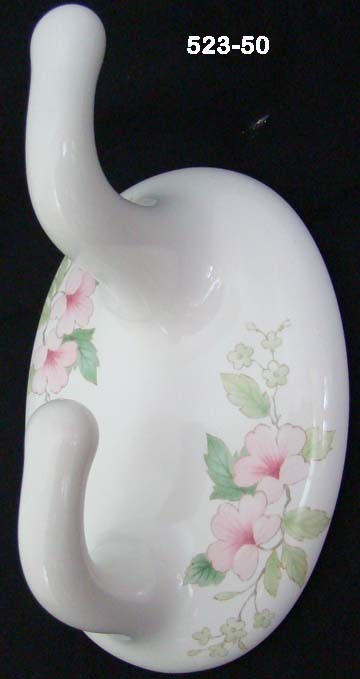 The Blossoms on White floral pattern is a 3-tone pink flower with multi-tone green leaves, and small green flowers. Kind of a vine pattern. 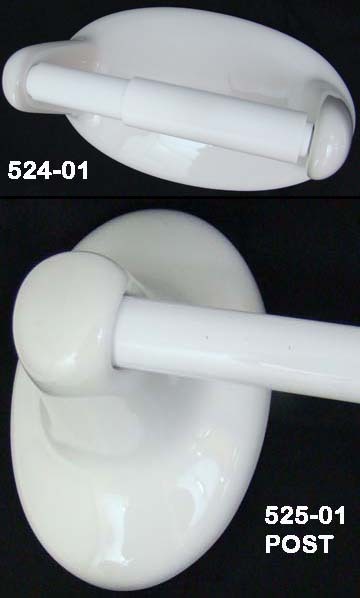 The bars in the 18" and 24" Single towel bar assemblies are metal with a white epoxy coated white finish. 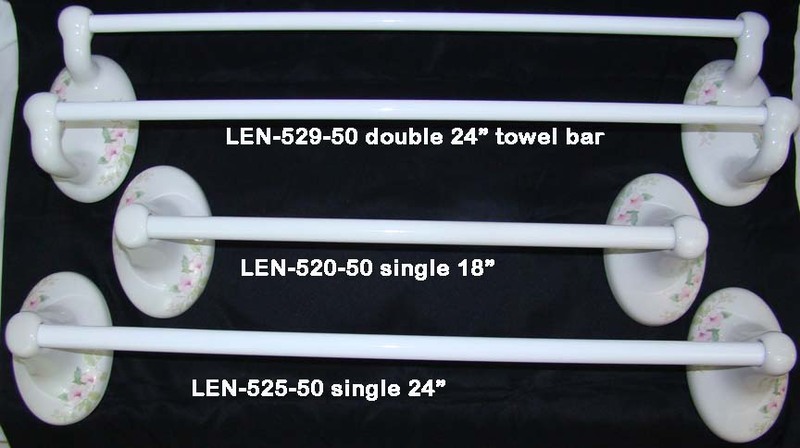 Very high gloss and looks like porcelain, but with the strength of steel The bars that now come with the 24" double towel bars, the LEN529-01 and LEN-529-50 are now plastic rods, 5/8" dia. plastic tubes. 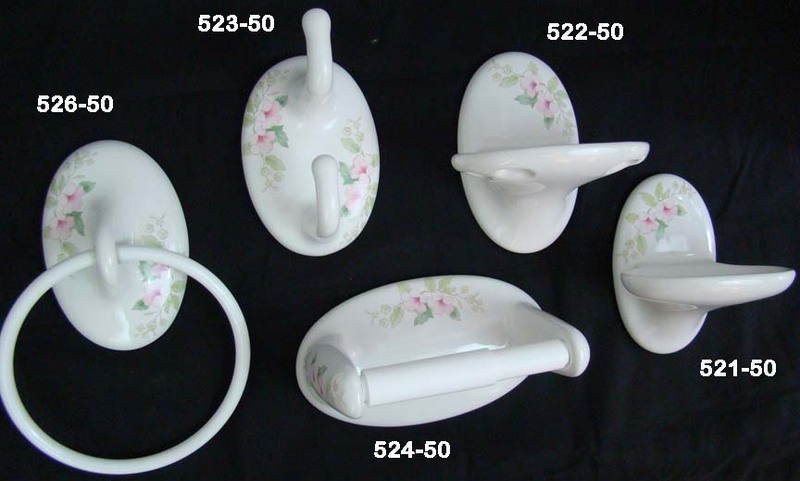 So if you need the Classic single 24" or 18" towel bars, the 24" or 18" double towel bars, TP holder, soap dish, double robe hook, or towel ring, they are back. 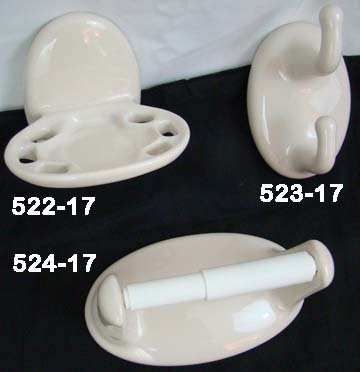 This style of ceramic bath hardware can compliment most bathrooms. 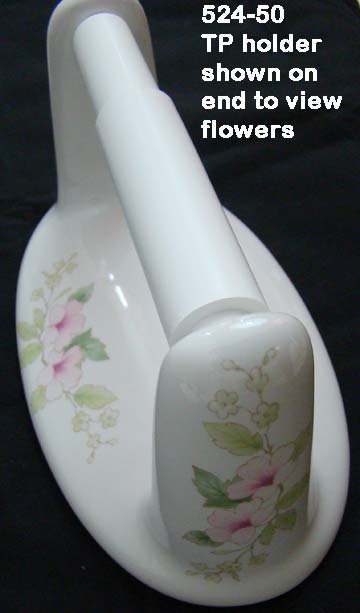 It is glossy white, even the Blossoms pattern is on the same glossy white. So if you have stoneware or aged looking tile in your bathroom, obviously, this is not a good match. 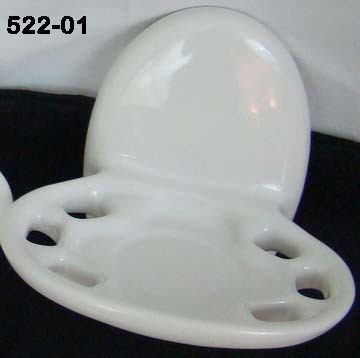 But if you have white toilets, tub, or other light colors in the bathroom, this works well. For stoneware items, we invite you to check out the AC Products 900 Exceptional Series. We are going to have a lot of nice size pictures below to help with your selections. Pricing for the White will be in a grid just after all the white pictures. Then pricing for the Blossoms on White will be after the Blossoms pictures. 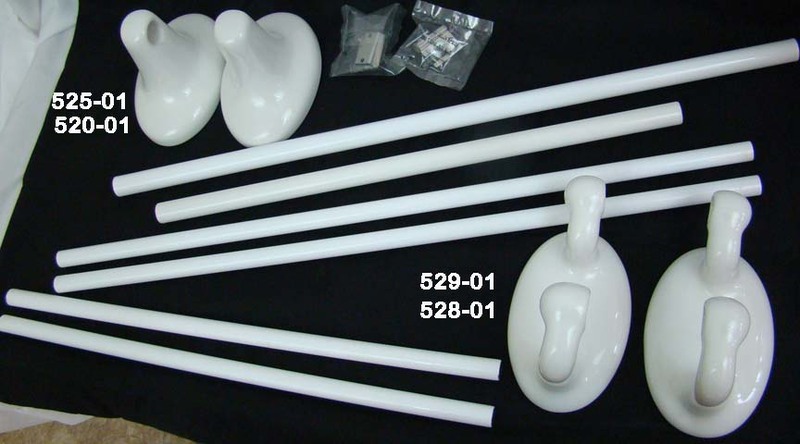 The 529-01 and 529-50 double 24" towel bars now come with round plastic bars. posts 3-11/16" wide x 5-5/8" tall x 4" protrusion, assembled width 21-11/16"
3-9/16" wide x 5-5/8" tall x 4-1/16" protrusion, dish width is 5-1/8"
posts 3-11/16" wide x 5-5/8" tall x 4" protrusion, assembled width 27-11/16"
3-5/8" wide x 5-1/2 tall x 2" protrusion, round white metal ring is 6-1/4" dia. 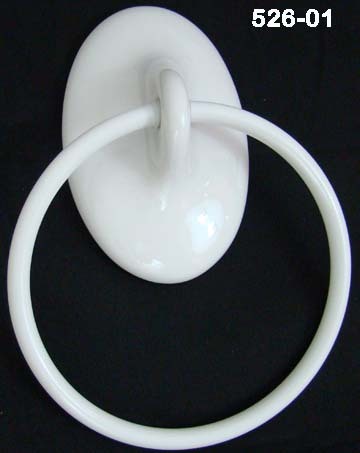 The bars for the single towel bars are round metal with white epoxy coated paint. The double 18" bars are metal, but the double 24" bars are plastic. The above picture shows you the proportion of each piece to each piece. Pictures below are blow up images. 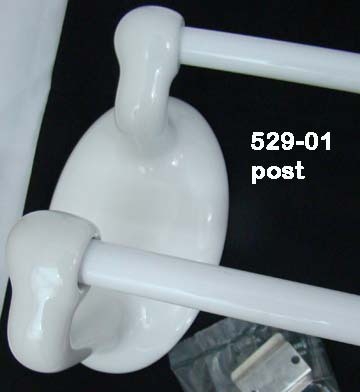 The bars for the towel bars are round metal with white epoxy coated paint, except the 529-50 comes with two plastic 24" bars. A long time ago, in a Galaxy not so far away, the Lenape Classic Collection was made in bone colored porcelain also. 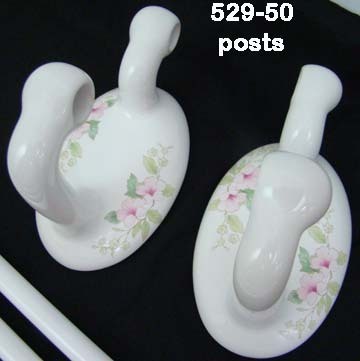 These items were discontinued in 2009 and most sold off shortly after. Our remaining stock on the bone color is on closeout, and here is what we have left. 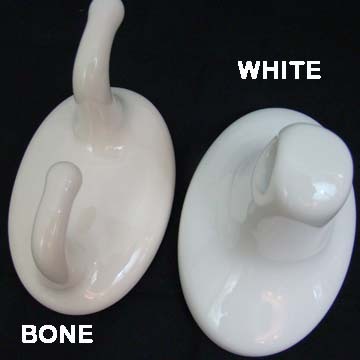 Also a picture for you to show the difference between bone and white. tapered clip(s), screws and plastic anchors, included with all items. Towel bars come with 2 each. All other items 1 each. **ALL 18"and 24" towel bars can be cut shorter if the standard sizes are too big for your application. Ordering information: Please state the Lenape item number from the grids above and quantity desired. 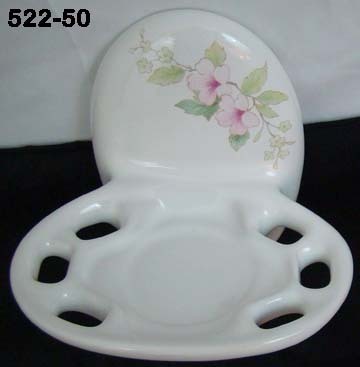 We stock all bath items in the White color and Blossoms on White. Anything left in Bone, we are closing out. Quantities left noted above. 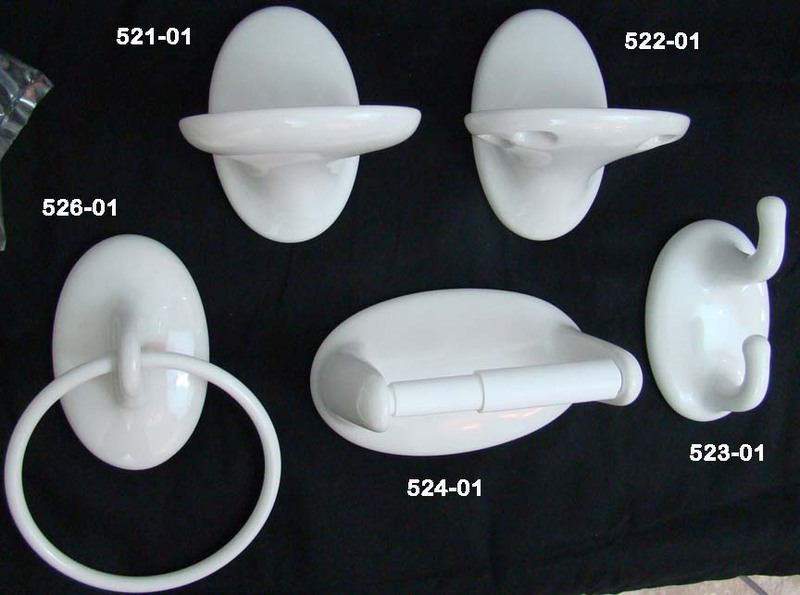 We now offer AC Products ceramic bathroom hardware in addition to Lenape Products. Wherever you see this image and text block near a discontinued Lenape item or color, this means there is a near exact OR suitable substitute item available from AC Products in lots of colors. Select this link to advance to the AC Products page showing comparable items.